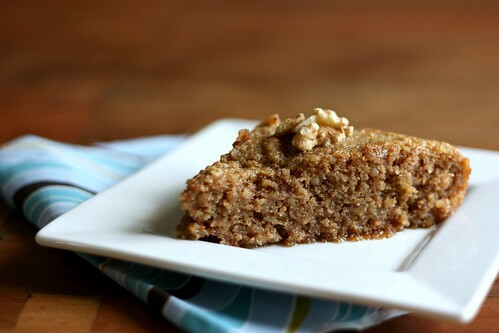 Karidopita (Greek Walnut Cake) – Elly Says Opa! I recently went dairy-free, in an effort to see if a dairy sensitivity might be causing a few issues Ian seems to be having. I don’t think I need to tell you that eliminating dairy is tough – I mean, eliminating most dairy is one thing, but living without cheese is quite another. The jury is out on whether this is helping Ian, so I might end up adding it back into my diet into a few weeks, but in a cruel twist of fate, I’m currently still eating this way, which meant no dairy this past Sunday—Orthodox Easter. An Easter without tzatziki, feta, or tsoureki? For.the.birds. When I was walking to pick up lamb for Easter, Tom mentioned I should pick up some sort of Greek dessert. I said, “Well, I can, but I can’t really eat any of it.” (insert sad face). But, as I was walking, I remembered karidopita, which doesn’t have any dairy in it. And the upside is that it’s one of my favorite Greek desserts of all time. It’s not that different from most Greek desserts in that it’s soaked in syrup (why mess with a bad thing, I guess). But there’s no butter and it’s really easy to make. OF COURSE after I bought the zwieback biscuits, I looked at the ingredients and the very last one was sweetened condensed skim milk. Of course. But, I figured it was the last ingredient, the toasts are only one component of the whole cake, and it’s not like I would be eating the whole cake (in theory…). If you’re dairy-free and this small amount is too much, however, you can replace the zwieback with breadcrumbs or most likely semolina flour. I’m not sure if melba toasts have dairy, but those may also be a good substitute. I’ve been playing with this recipe for a while. I originally cobbled it together from two separate Greek church cookbooks. I’ve since reduced the amount of eggs and syrup, and made a few other changes. A lot of people don’t use honey in their karidopita, opting just for a simple syrup, but I prefer to add it. This is now my standard/go-to recipe. I only made half the recipe below, but this keeps really well, so there’s really no reason not to make the whole thing (unless you only have half the amount of walnuts and are too cheap to buy more from the expensive store where you’re buying the meat. Ahem.). Preheat the oven to 350 and grease a 9×13″ baking dish. If desired, line with parchment paper and grease (the syrup added later will be sticky so parchment will make for easier cleanup). Place the egg whites in the bowl of a stand mixer and whisk until stiff. Place the egg yolks in a large bowl (or a second stand mixer bowl, should you be so lucky) with the sugar and beat until pale and yellow. Beat the vanilla into the egg yolk mixture. Grind the zwieback toasts in a food processor and place in a bowl. Add the walnuts to the food processor and pulse-process until they are crushed into very small pieces (but not like a powder; you don’t want to make walnut meal). Stir the walnuts into the bowl with the zwieback crumbs, along with the cinnamon, cloves, baking powder, salt, and orange zest. Then, add to the egg yolk mixture, just until combined. Slowly fold the egg whites into the mixture in 3 additions, folding just until incorporated. Pour the batter into the prepared dish and smooth the top with a spatula. Bake for about 35 minutes or until a toothpick comes out clean. Cool the cake completely, and then cut into triangle or diamond shapes. To make the syrup, combine the water, sugar, honey, orange peel, and cinnamon stick in a saucepan. Bring the mixture to a low boil and continue to simmer for about 10 minutes, until thickened slightly. Allow the syrup to cool for just a few minutes before removing the cinnamon stick and orange peel and pouring the syrup over the cut cake (Alternatively, you can pour room temperature syrup over a hot cake). You may have a little extra syrup; use your judgment but remember the syrup should soak through the cake. Stud each piece with walnuts or whole cloves, if desired.